The patient is a 27 year old right hand dominant male heavy equipment operator who was riding his dirt bike with his wife (she has her own dirt bike) and his 3 year old (who also has her own dirt bike, with training wheels). He was going down a hill rather fast, went into a curve, and crashed, flipping over the handle bars. He had immediate pain in his left non-dominant wrist, with deformity and an inability to move his wrist. He was seen at a local hospital, xrays were read as a distal radius fracture. He was placed into an off-the-shelf wrist splint and told to see an orthopedist. He had more pain than he thought he should have and therefore came to MGH ER the following morning. He also had numbness of the middle and long fingers. The following films were obtained, which were similar to the xrays from the outlying hospital. 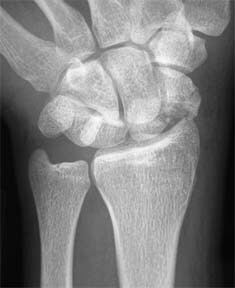 The diagnosis was made of a scaphoid fracture/lunate dislocation. After consultation with the orthopedic surgeon on-call, a referral to Dr. Nelson was made. The patient was examined and found to have a grossly swollen and painful wrist, with a partially numb median nerve. The diagnosis was made of a Mayfield Stage II trans-scaphoid, peri-lunate fracture-dislocation, distal radius fracture, and a median nerve injury/acute compression neuropathy. Note that the lunate is not displaced from the lunate fossa of the radius, and the capitate is dorsal to the lunate, making this a Mayfield Stage II. There are two variants of a Mayfield Stage II, the other being a scaphoid dislocation rather than a scaphoid fracture. The patient was taken to the operating room, where I performed an ORIF of the scaphoid, ORIF of the radius (with a suture anchor), an open reduction of the lunate dislocation, and decompression of the median nerve in the hand, wrist, and distal forearm. The head of the capitate had deep grooves in it (see photo below plus the magnified view), the median nerve was bruised, there was a hematoma in the carpal tunnel, but the scapholunate ligament was intact. The scaphoid was in three major fragments and there were many 2 x 2 mm fragments. Although the scaphoid was able to be reduced to well under 1 mm of displacement, there were gaps in the scaphoid fracture lines. 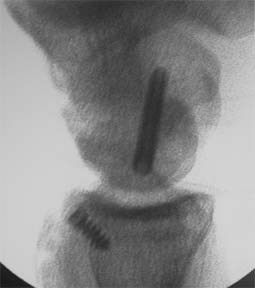 Intraoperative view of the wrist, with fingers to the left, radial to the top. 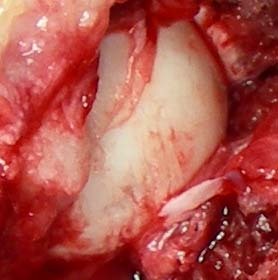 C is the head of the capitate; note the grooves in the lower portion of the capitate and the cartilage fragments lying around the capitate. R is the fracture surface of the dorsal rim of the radius. 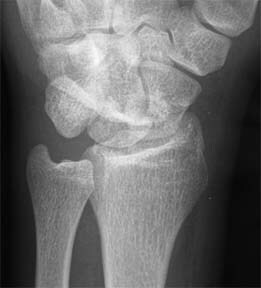 S is the fracture surface of the scaphoid; note the degree of injury to the bone substance. This is a magnified view of the head of the capitate. Note the many parallel grooves in the articular surface, caused by scraping across the fracture edge of the radius, and the multiple cartilage fragments. 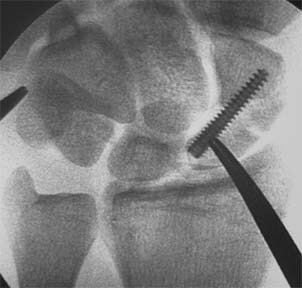 Intraop view of the repair of the scaphoid (note the butterfly fragment) but overall good alignment of the bone. 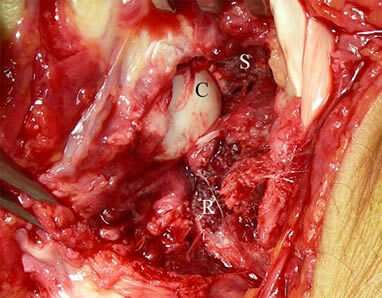 Not seen here is the loss of bone substance due to multiple 2 x 2 mm fragments of bone. The radius dorsal rim was in many small fragments, too small for even K-wires. The bone was brought back into position with two sutures, one anchored into soft tissue and one anchored with a MainStay suture anchor (designed by Dr. Nelson). The lunotriquetral joint appears well-reduced and was not pinned. At followup in five days, the patient's swelling was markedly reduced, he had little pain and was no longer taking Motrin and Tylenol (he did not need Vicodin). There was no numbness. The incisions were dry, nonerythematous. He was placed into a splint and referred to hand therapy, for gentle ROM of the wrist (no more than 30 degrees flexion or 30 degrees extension), full finger ROM. An Exogen bone growth stimulator was ordered. Due to the degree of bone loss of the scaphoid and the inability to completely close the fracture gaps, it was felt that stimulation now rather than later was a prudent option. Close followup of the lunotriquetral joint will be needed, to assess for instability. However, given the current stiffness of the wrist and the limited ROM planned for therapy, the LT joint will not be stressed.